The Venue page in PDF format. Use http://www.info.wien.at/ for tourist information and http://efawww.wiennet.at:8080/cgi-bin/tvor_anf.pl?Sprache=english for planning a route with public transportation in Vienna. Please contact http://www.cnn.com/WEATHER/eu/Austria/ViennaVIEX.html for a five-day weather forecast for Vienna. Vienna, a city with about 2 million inhabitants is situated in the heart of Europe. It is a city on which its ever-changing history has left an indelible mark, manifested also in the rich cultural heritage. The city's ultimate fascination stems from combining imperial grandeur with the explosive modernity that emerged from the break-up of the Austro-Hungarian Empire. Viennese writers, musicians, artists and scientists forged a new direction for the modern world in every field. Shaped by its hundreds of years as capital of an empire, Vienna will always arouse a dreamy nostalgia for times past, but that nostalgia is spiked by constant reminders of the turning-point where imperial dreams faded and the modern world began. Ferdinand Dommayer opened an elegant establishment in 1833, quite close to Schönbrunn. This is where Johann Strauß first performed in public, on October 13th, 1844. Among the audience there were members of the imperial family, owners of villas in Hietzing and other wealthy Viennese. Against his father's opposition the son had organised a small orchestra and with it appeared in public as a conductor. Since then Vienna had its Johann Strauß senior and Johann Strauß junior. After this concert the journalist Franz Wiest wrote the humorous but prophetic words: "Good night, Lanner, good night, Strauß father, good morning, Strauß son." Today the elegant Parkhotel Schönbrunn stands on this spot. 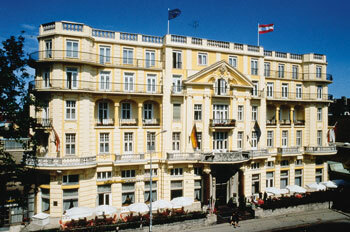 The conference will take place in the Parkhotel Schönbrunn. It was built in 1907 as the guest house of Emperor Franz Josef I. and today offers modern comfort to the visitors to the romantic city of Vienna. The hotel is located in the immediate vicinity of the 'Schönbrunn Palace' and is surrounded by a park. The imperial atmosphere of bygone days together with modern facilities and friendly service make the hotel unique in the city of Vienna. The hotel owns one of the few preserved classic ballrooms in Vienna with a unique ambience in which numerous traditional balls take place. All public rooms and most of the guest rooms have been refurbished in 1999 and 2000. The Parkhotel Schönbrunn is located in the vicinity of the Schönbrunn Palace in the district 'Hietzing'. The entrance to the park of the palace, its various entertainment possibilities and the zoo of Schönbrunn is directly opposite the hotel. The city centre can be reached by underground U4 in about 8 minutes - the station 'Hietzing' is also very close to the hotel. A parking garage is available at the hotel. Prizes upon request to the hotel. Südbahnhof Take tram number 18 (heading to 'Burggasse-Stadthalle'), at Station 'Margaretengürtel' change to Underground U4 (heading 'Wien Hütteldorf'), leave U4 at station 'Hietzing'. Westbahnhof Take Underground U6 (heading 'Siebenhirten'), at station 'Längenfeldgasse' change to Underground U4 (heading 'Wien Hütteldorf'), leave U4 at station 'Hietzing'. Franz-Josefs-Bahnhof Take tram number 5 (heading 'Praterstern-Wien Nord'), at station 'Friedensbrücke' change to Underground U4 (heading 'Wien Hütteldorf'), leave U4 at station 'Hietzing'. Praterstern-Wien Nord Take Underground U1 (heading 'Reumannplatz'), at station 'Karlsplatz' change to Underground U4 (heading 'Wien Hütteldorf'), leave U4 at station 'Hietzing'. When leaving station 'Hietzing' cross the street in front of you, then turn left, cross the next street, and go straight ahead. You find the Parkhotel Schönbrunn after approx. 50 m.
All flights to Vienna arrive at airport 'Wien-Schwechat'. From there you can take a taxi (20 km), a shuttle bus to railway station 'Wien Südbahnhof', or a train. The trains from the airport to Vienna end at 'Südbahnhof'. From 'Südbahnhof' you can use public transportation as described above. Westautobahn (A1) Cross 'Hietzinger Kai', then go to 'Hietzinger Hauptstraße'. Südautobahn (A2) exit 'Altmannsdorf', then 'Altmannsdorferstraße'. From 'Grünbergstraße' travel to the ,Linke Wienzeile', then from 'Hadikgasse' turn into 'Hietzinger Hauptstraße'. Ostautobahn A23 exit 'Altmannsdorf' - continue like above. Donauuferautobahn (A22) exit 'Altmannsdorf', - continue like above.